In honor of Memorial Day…With much gratitude to our soldiers and with deep longing and prayer for peace. Freedom is [Not] Free. And when folks began to salute, it then hit me what was going on. Our flight was carrying a fallen soldier home. Now, I don’t have more details of who this fallen soldier was. I don’t know if it was a man or woman; nor the details of how the soldier died; nor the details of where or what war or conflict. Honestly, I don’t know what the honorable and respectable way to speak of this. It isn’t my intent to sensationalize this but to simply share how the image of the casket being moved from the airplane to a vehicle has been fixed on my mind. Additionally, the image of what I assume to be the parents and siblings of the deceased soldier embracing one another – and the image of the mother with her face covered by her hands will remain seared on my mind. What must have gone through their minds? The tone on the airplane changed dramatically. I’ve never seen such a packed flight of people – for the past 15 minutes ago – complaining, grumbling, snickering – grow so silent. Eventually, many began to deplane but ever so quietly but there were also several including myself that simply sat by a window seat to observe, wonder, and lament. Is it just me or have we forgotten? With much gratitude to our soldiers – especially our fallen soldiers – and with deep longing and prayer for peace. Previous f**k human trafficking. there i said it. Wow. Events like this make it real and not something worlds apart from the way we live. Pfc. Court D. Haugen, 23, was hit by a train on March 11th. He was an infantryman assigned to the 2nd Stryker Cavalry Regiment in Visleck. He was returning to Fort Lewis after serving 15 months in Iraq. Governor Gregoire ordered flags to fly at half mast today in honor of this soldier, I’m not sure if it was the same one who was on your plane but the timing is right. @maia: i saw that in the news this morning. for some reason, i think it’s another soldier but don’t know for sure. The counter didn’t stop when the media stopped covering the continuing death tolls.. there are lives and faces behind this war. so let me remind everyone… 4579 dead in iraq and 671 dead in afghanistan (to date) and thats just US. allied forces: 179 dead in Iraq and 449 in afghanistan (to date). once i get the site up i am committed to having a profile for every single one of them. Thank you for sharing such a powerful experience–and reminder to keep our soldiers and their families in our prayers. Everyone should read this from the Rocky Mountain News (“Final Salute” Friday, November 11, 2005). Thanks for committing your experience to words. It brought tears to my eyes and serves as a powerful reminder. Appreciated this post today. Thanks, Eugene. I am an Iraq veteran, and our company lost 2 soldiers during our deployment, including one in my platoon. As a veteran, I must say that it really does feel as if the country has forgotten about the war(s). Thank you for writing about this. We think about the war every single day. We fight for the benefits that we deserve. We thank our Father for allowing us to come home alive, those of us who do. I will pray for that mother you saw.. and I will pray for all the other mothers who will lose their son or daughter today. Thank you for sharing that moment. I have heard other similar stories, but knowing someone that experienced it brings it even closer. One more thought……just last month more returned vets committed suicide than were killed in Iraq & Afganistan. Also, a large portion of our vets are the ones on the streets – we need to do something about that here! Highly recommended. It puts on film what you experienced. I was brought to tears during the entire movie at the lengths and reverence our government goes through in bringing our fallen soldiers home. I recently posted about this. God bless each member of our military. I don’t care what your political leanings are or whether or not we agree with where our country is in this world, we owe everything to those brave men and women who lay down their lives for us. 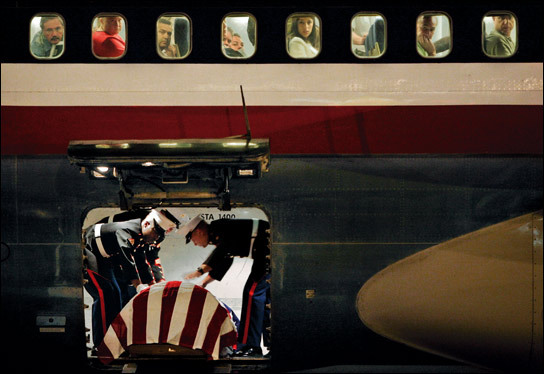 From the picture, the plane was carrying a Marine. Nevertheless, s/he is one our fallen heroes. Not that I glorify war or combat veterans, but being an Army chaplain, having conducted memorials for my own fallen Soldiers in combat and having attended more memorials than I care to remember, and having been part of death notification teams, I can personally say that the country has definitely lost the concentrated effort to remember that our men and women in the Armed Forces are putting their lives on the line everyday. I couldn’t stand the way most people were carrying on about petty things of life when I first returned from Iraq. There are so many more important issues to be concerned with in this world. I pray that we will never forget the sacrifices that young men and women make in the military everyday, so that we Americans can enjoy the joys of freedom, liberty, and all the little things that we can, and often do, take for granted. Eugene, God bless you and your ministry. I’m proud to have known you in seminary. Please keep praying for all of our military personnel until they all return home. As one who identifies as Christian and almost pacifist. I think I too would have been moved by the experience. I think I would have also lamented, felt empathy, and prayed for peace. However, it is difficult for me to be grateful because I disagree with Christians joining the military. I recognize that I benefit from the military and the persons in it, but I prefer that they not do what they do. As a military family member and one who has attended more fallen soldiers services than I ever thought I would, thank you for taking the time to grieve and lament. It doesn’t stop the hurt, but it does help to know that people care. Hi, i just wanted to clarify. That was not Court Haugen in your picture. Though the times do line up, i knew him, and his family, and thats not him. First of all, he was in the army, and the soldiers in your pictures are Marines. And i saw pictures from his family retrieving his casket, and all the soldiers that helped in that, were all Army, as well. Prayers and respect for the soldier and his/her family… and thank you to all of our veterans and fall solders for your service to our community and country. Eugene, thanks for this. I feel terrible on Memorial Day because I really, truly feel that the right way to honor those who serve us as soldiers is to honor them long before they die…by not sending them into engagements without a carefully thought-out purpose. That any of our forces still die in Iraq breaks my heart over and over. We owe them far more than that – they need to come home. And we owe those who come back far more than they are getting in coping with how they have been used. I lament this. Peace to this soldier’s memory; comfort to his loved ones, from God’s hand. Why do we continue to kill our men and women with these senseless wars? Why do we call fallen soldiers “heroes” when they themselves are/were killing machines? Why do we applaud empires, military supremacy, and other systems of Caesar and worldly kingdoms? Why do we praise our military and might, but turn a blind eye to innocent men, women, and children who died from collateral damage? American Christians have several idols in their midst: nationalism, American exceptionalism, militarism, and patriotism. All of which many American evangelicals have bowed at their altars. I hope and pray that American Christians will turn away from these idols, and turn to the only One who gave us true freedom at His expense… Jesus our Lord and King.